One day while driving this idea to make Nacho Fries out of Avocados hit me, so now we have this tasty Keto Avocado Nacho Fries Recipe to be thankful for. There are a few easy tips and tricks to getting this to turn out just right, but rather than frying them we opted to bake them in a cast iron skillet. You could of course also make these in an air fryer too if you want to. I prefer to make them in the cast iron skillet because it just seems to present much easier, and then you don’t have to worry as much about the avocados falling apart when you try to remove them. 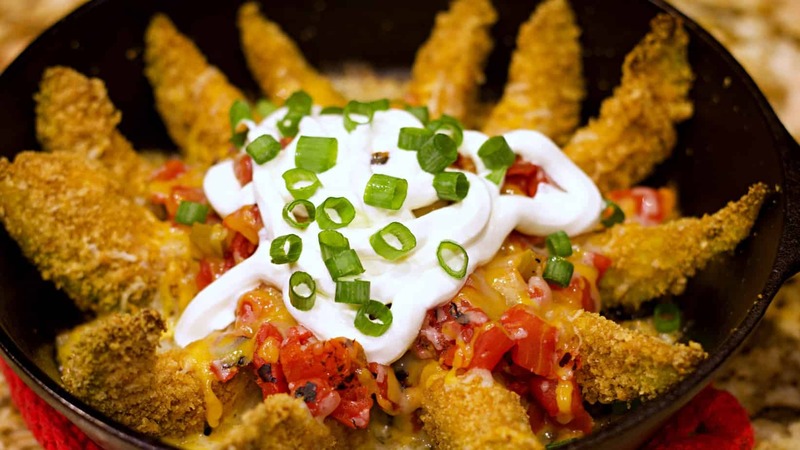 Depending on how ripe your avocados are when you make them, these Avocado Nacho Fries can have varying degrees of firmness. If you like them to be more solid and have a firmer bite to them then use a less ripe avocado. Don’t use an avocado that is overly ripened, as that might not survive the part where you coat them in pork rinds. Sometimes you can just grab the avocado slices right up and eat them, other times a fork is recommended. In a Food Processor grind up the bag of Pork Rinds until they are all tiny little crumbs, like the size of bread crumbs. Peel and Slice Avocados into 8 pieces each if you can, and set on some parchment paper while we work on coating them. Season the Avocado Slices with the half of the seasoning, and season the pork rinds with the other half. Dip the Avocado Slices one at a time into the pork rind dust and press the pork rinds gentle into the soft flesh of the Avocado Slice. Set the Avocado Slices back on the Parchment Paper when you are done. If necessary, Repeat this process once more by putting the already coated Avocado Slices back into the Pork Rind crumbs one at a time and re-coat them to make sure they are extra coated on every nook and cranny. Place Avocado Slices in a Cast Iron Skillet (Or in your Air Fryer Basket if you prefer) with spacing between them so that they can properly crisp all around. Bake the Avocado Slices in the oven at 400*F for about 25 minutes. Carefully remove the skillet from the oven when the pork rinds begin to get a dark golden brown color. Sprinkle half the Shredded Cheese on top of the Avocado Slices, and place the RoTel Fire Roasted Diced Tomatoes and Green Chilies in the middle of the pan on top of the Avocado Slices. Sprinkle the remaining Cheese on top of the tomatoes and return to the Oven for about 3-5 minutes more to properly melt the cheese and warm up the tomato mixture. Christine, I don’t sell cookbooks. Maybe you are referencing something in an ad that you saw online? I don’t eat pork. What can i substitute for the pork rines? How did ordering Bacon and Butter online turn out? Never bought cold items like that online before. It’s a cookbook with bacon and butter recipes. On your bank transaction history, it may have a phone number to the business in the description of this transaction. I saw the same 3rd party add on this site, selling the cookbook you ordered. I clicked on the link. At the bottom of the website, it states that it is a digital cookbook. That means you have to download a pdf file. See if you recieved an email with a downloadable file. I may be wrong, but that is what read. Good luck! I bought both those books. and YES you have to download them. I chose to print it out. You don’t actually get book! They send you the cookbooks in an email as a pdf files you can download to your phone or tablet. I received the book in the mail, not a PDF file. Can this recipe be tweaked for vegetarians? Question, as I am always looking for food ideas too: What do keto vegetarians typically crust their “fried” style foods with? Panko Crumbs are bread crumbs, which would contain carbohydrates. Pork Rinds are kind of like panko in texture though. Do you have an alternative to pork rinds? I do not eat swine, as it is against my religion. Hi Rebecca, I recently discovered that there are some Asian Grocery Stores that sell the chicken version of pork rinds. So essentially deep fried Chicken Skins. They’re very similar, and of course pork-free. Use these as hold together so well. what could sub for the pork rinds? That’s a tough one on this recipe, because the typical parmesan crust that people sometimes use might be too sharp tasting for avocados. That was my thought at least. We have made this with almond flour/parm mix. It’s one of my favorites. Excited to try your recipe! How do you get the crumbs to stay on? I always had trouble with that. You press them into the Avocado flesh manually. Firmly press them into it. since we dont eat pork, what can be used in lieu of pork rinds if anything? I heard that cooking avocados make them bitter. Yet these are cooked for 25 minutes. Are they bitter? They don’t taste the same cooked as they do raw, that’s for sure. But they weren’t bitter. We have a Mexican Food Restaurant here where I live that serves a stuffed, battered and fried avacado dish, and it’s really good. The avacados don’t taste bitter. 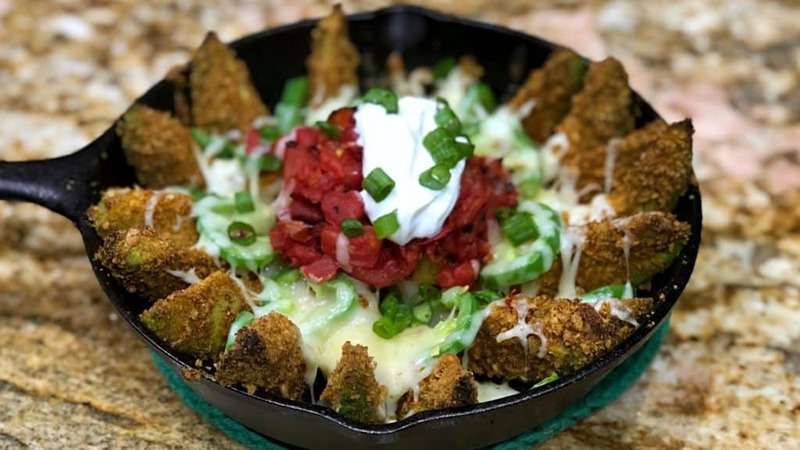 Since starting Keto, of course I can’t have theirs anymore because of their batter, however, I will definitely be giving these Keto Avacado Nacho Fries a try. Seasoning the Avocado as I did in the recipe is also key to making them have some flavor. No they are not bitter I just made these today and they were very good I used buffalo style pork rinds instead of the seasonings. What if you don’t have a cast iron skillet or an air fryer, what shall I use? Do you have an Oven-safe Baking Pan or Skillet? Where is the nutrition information for the whole thing? We need that, nut just for the avocadoes. That’s the Nutritional Facts for the whole thing, toppings and all. I just figured it was easier to factor portion sizes by Avocado Slices since most people don’t weigh their food out. I was wondering if crispy-fried bacon sprinkles would detract from this recipe? Thanks a bunch! You suggested using hot sauce. How about mixing Pace Picante Sauce with sour cream? I do that all the time, and it is a really great combination! (Just a thought). Yes, get as creative with it as you want to! Try using Sambal Oelek. It is ZERO carbs and nice and spicy! I can’t wait to make these. I love avocados and they’re nice and filling too. I’d throw a handful of fresh cilantro over to serve. These look amazing, who’d ever thought of preparing the ‘nachos’ this way. Btw, I love the music that goes with this, care to share? not a huge avocado fan; any other suggestion? Is there any alternative to pork rinds ? I don’t eat port or beef and these look amazing! Do you eat chicken? I have seen some “Chicken Rinds” at various Asian grocery stores here in the US. If you can think of anything else that would have a similar texture, feel free to give it a try. How long would you suggest putting into the air fryer? The Nachcs Look very appealing. I will try them! Just curious, what size is the bag of pork rinds you used? I made this and ended up with a whole lot of leftover rind crumbs. Living up in Canada now, I know the bag sizes are different. I froze the extras and will definitely make this again. I used a 8 oz bag and had left over un- crumbled rinds.